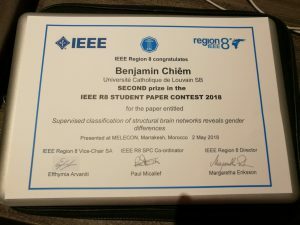 The IEEE R8 Student Paper Contest just took place at Melecon 2018 in Marrakech (Morocco). This year, it was Benjamin Chiêm who had the difficult task of representing UCL. In the end, Benjamin ranked second with his thesis “Structural classification of structural brain networks reveals gender differences“. Congratulations to him and to all other participants ! What is IEEE R8 SPC ? Each year, the UCLouvain IEEE Student Branch participates in the Student Paper Contest organised by the IEEE Region 8 (Europe, Middle East and Africa). To participate in this contest, each Student Branch sends one former Master student to present his Master thesis. A jury of professors from different countries evaluates the submissions and selects the 5 finalists, who are then invited to defend their thesis orally. The records of previous UCL participants and their achievements can be found here. The UCL IEEE Student Branch is supported by the ICTEAM and the IEEE.